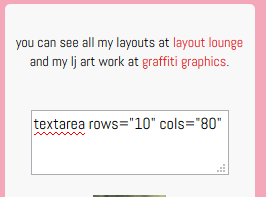 Looks like there more than one line of a gap between my text and my textbox. There is a HUGE gap between my book images and my table. How do we fix this? 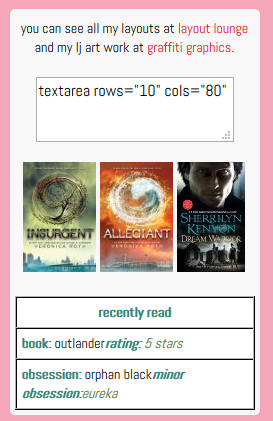 First, when you see extra spacing on the sidebar, always check the blurb text coding first because sometimes it is just the coding in that section. First if you notice the center is on a different line than my text as is the /center. In the free text this will mean extra space. 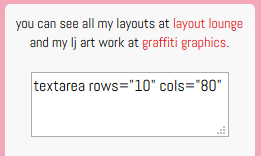 Also, you need to look at the textbox (or text area) like this: the and blank line between my textbox and my text is 2 lines which is why the gap there looks greater than I want. 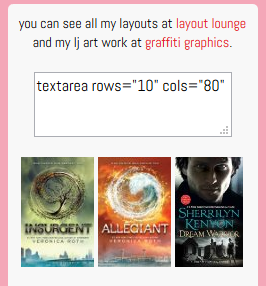 If I change the coding to what you see below it will change the look of my free text. No matter what you do the center and /center will act as a line so this mean for only one line between text and textbox I must remove any extra lines between them in my code. There appears to be only one line between the images and the table. But what have we learned so far. Any extra line breaks can result in extra space. But how can that be because our table looks normal? This mentality of coding is pretty much the same when dealing with your profile coding. So the same principles apply. oh! this is a big help! Thank you so much for taking the time to resolve this! No problem. Just making this tutorial/explanation really made me think about my profile work and how to improve it so thank you right back!